Biotrue rewetting drops are an ideal solution to help instantly soothe and hydrate dry eyes caused by a variety of factors. Containing sodium hyaluronate, they naturally refresh and soothe dry eyes, relieving symptoms of fatigue, irritation and redness. 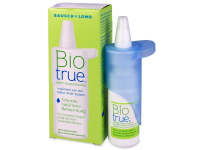 Biotrue MDO drops are supplied in an innovative, preservative-free, multi-dose bottle. Biotrue rewetting drops are a natural splash of freshness providing instant hydration for your eyes. Note: The eye drops can be used for 6 months after opening. Biotrue MDO drops are suitable for use with all types of soft contact lenses and are produced by Bausch and Lomb.